Distorted central vision: When you are experiencing distorted central vision, even ordinary activities like driving and reading will present a challenge. If you see distorted lines, blurred words on a page, or darkness in the middle of your vision, then you should visit an eye doctor immediately. Fading of color vision: In this case side vision is not affected, as there is not a total loss of sight. Fading color of vision causes the good eye to make up for the bad eye (if the condition involves only one eye). Consequently, the compensation makes it possible to conceal the symptoms of the disease. 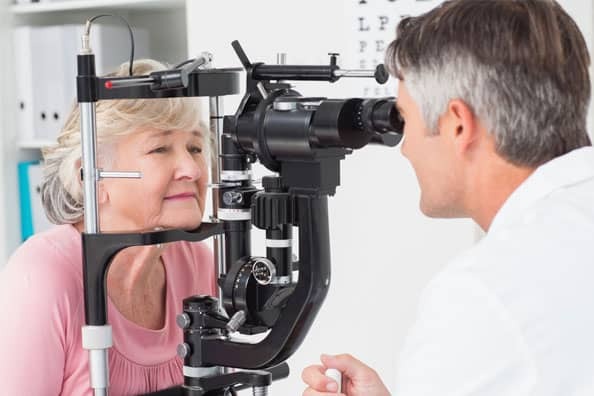 Dilated eye exam: The doctor dilates your eyes in search of yellow deposits called drusen that appear under the retina. Amsler grid: When looking at this grid, if the straight lines begin to look distorted, broken or faded, then it may be a sign of macular degeneration. Optical coherence tomography: This test is used to determine the thickness of the retina. This is a noninvasive imaging test that helps determine whether fluid has leaked into the retina. Fluorescein angiography: This technique uses a special camera and dye to identify retinal changes or abnormal blood vessels. A dye will be injected into a vein in your arm and will travel to the blood vessels in your eye, highlighting them along the way. The special camera will take pictures as the dye travels. Indocyanine green angiography: This is very similar to fluorescein angiography in that a dye is injected. This test is used to confirm any findings in the fluorescein angiography test and can also be helpful in identifying specific types of macular degeneration.